The Freedom From Religion Foundation is asking for an end to an unconstitutional tie-up between a Wisconsin school district and a parochial preschool. In Beaver Dam Unified School District, 3-year-old public school students with developmental delays are often sent to private preschools. FFRF's complainant, who has an eligible child, was offered only one choice: a Catholic school, St. Katherine's, whose preschool is named God's Little Miracles. 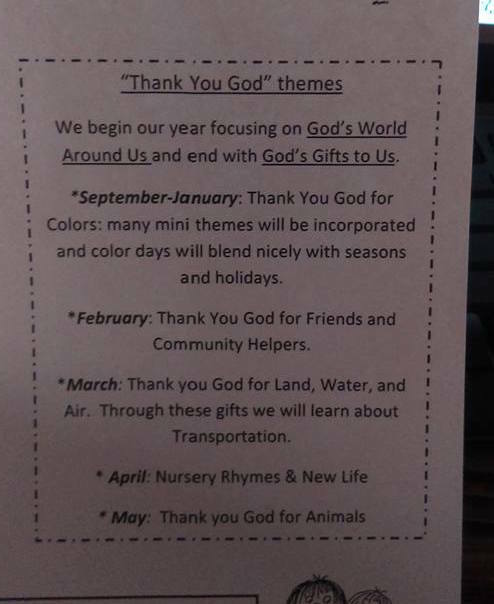 To quote the school itself, its "program is based on the theme 'Thank you, God.'" 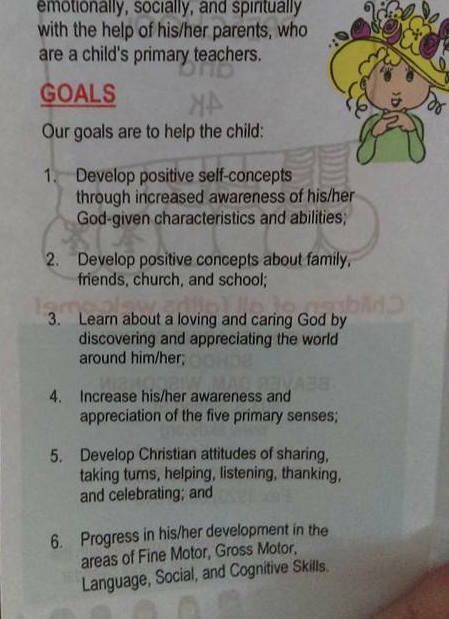 Materials the complainant received from a Beaver Dam Unified School District teacher contained many religious references and images, such as goals that include "Learn about a loving and caring God" and "Develop Christian attitudes." The materials also depict a "Birthday Blessing" in action. "It is wildly inappropriate for the School District to send 3-year-old public school students to private schools for religious instruction," FFRF Legal Fellow Ryan Jayne writes to Stephen Vessey, superintendent of the Beaver Dam Unified School District. "Court have repeatedly struck down public school practices that affiliate public schools with religious groups and religious instruction. By sending students to receive religious instruction at St. Katherine's, the district is violating this constitutional principle." The teacher reportedly assured the FFRF complainant that the God's Little Miracles program does not involve religious instruction. But the materials show that this is not the case. From the name itself to the pervasive nature of religion in its goals and teachings, God's Little Miracles is not an appropriate place for a public school to send children for learning. The current policy is especially egregious, with a captive audience of impressionable 3-year-olds with developmental delays. "With a Christian god permeating everything in the curriculum of this preschool, it's absurd for the Beaver Dam Unified School District to send preschoolers to God's Little Miracles," says FFRF Co-President Annie Laurie Gaylor. "Public schools can't excuse such overt religiosity." FFRF is requesting that the Beaver Dam Unified School District cease any partnership with St. Katherine's, unless and until it completely revamps its program to make it totally secular. The Freedom From Religion Foundation is a Wisconsin-based organization dedicated to the separation of state and church, with almost 24,000 members, including more than 1,300 in Wisconsin.